Ever seen a Hummer go full Popeye? 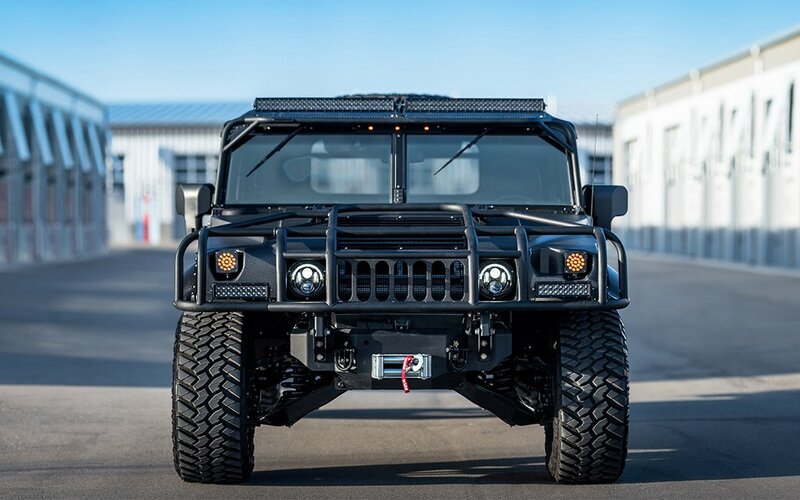 The Detroit-designed Launch Edition by Mil-Spec Automotive reimagines the Hummer H1’s iconic chassis and exterior with the addition of some serious beef, resulting in a renegade auto that looks like it could go 15 rounds with an M1 Abrams. The specs? A turbo diesel engine pumping out 500-HP and six-speed automatic transmission, all wrapped up in an aerospace-grade aluminum frame standing more than seven feet off the ground. The designers included five different chassis, with various door and hardtop cab configurations, and each comes in a powder-coated body with LED lights, hood vents and grille inserts. They didn’t forget about the interior, either, where you’ll find everything from heated windshields to marine-grade leather to an amplified audio system. Contact Mil-Spec Automotive here for pricing options on your own bespoke Hummer H1.